If you do not provide adequate written notice, it may result in extra expenses or loss of money. For instance, you might lose your security deposit or be liable for an additional month’s rent, as many leases state that a month-to-month agreement is assumed if no notice is provided before the lease term expires. Write the 30-day notice letter to your landlord in standard business format, even if you are on a first-name basis. Start with an address block listing your information or print the notice on your own letterhead. Follow with the date you are mailing the letter and an address block with the landlord’s information. Open the notice with a formal greeting, such as “Dear Mrs. Jones:” or, if you have a friendly relationship, you may use the property manager’s first name. Discuss any details and make plans to tie up any loose ends. For instance, you may wish to request a walk-through inspection of the home with your property manager or you might want to ask for details on the final inspection, if you do not choose to be present. Explain when you will surrender keys and any other items, such as parking permits or remote-controlled garage door openers. If you paid a security deposit and wish to have the balance mailed to you, provide your forwarding address. Even if you prefer to set up a time to pick up the balance of your deposit, offering your new contact information can be helpful in the event that mail is not forwarded immediately or packages are delivered to your old address by mistake. Closing with a cordial note of thanks is not mandatory but is certainly polite, especially if the property manager was kind and considerate while you rented the home. Mailing the letter via Registered Mail will provide you with proof that you submitted the notice within the 30-day window, should there be any dispute later. You may also decide to require the recipient’s signature on the return receipt as evidence that the landlord received the notice. 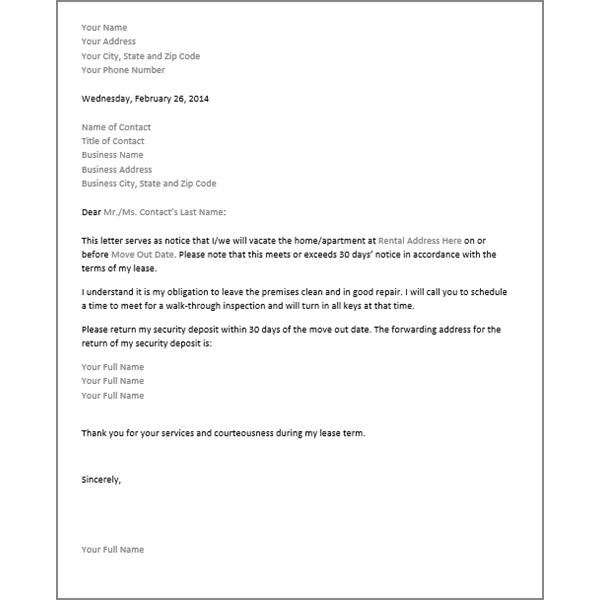 If writing a 30-day notice to your landlord still intimidates you, simply download the template provided here and customize it with your own information. The Microsoft Word template includes fields with sample text to guide you. Simply type over this text with your details, such as the rental address and your move out date. Please note that the date field updates automatically, so if you do not plan to mail the letter the day you print it, you will want to change the date accordingly. It is important to note that simply submitting a letter notifying your landlord that you intent to move is, in most cases, not a legal or adequate manner of breaking a lease. If your current lease has more than a month remaining and you want or need to move out, you should seek legal advice prior to doing so.